Michelangelo di Lodovico Buonarroti Simoni, more commonly known as Michelangelo was born on March 6, 1475. In the art world, his name is nearly the same as the term-masterpiece. For that is what he is, for the wealth of knowledge and masterful artistry and creativity he imparted his contemporary artists and all the artists that came after him. He lived a long life, leaving this earth on February 18, 1564. 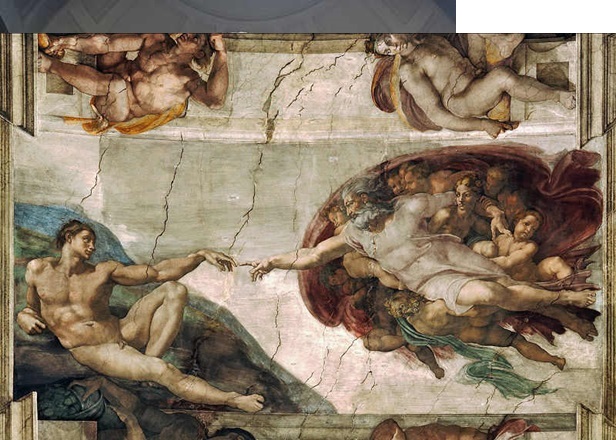 Michelangelo was unmatched as an artist, His works are of rarified beauty. He was a genius. He was recognized, but during his time when patronage is what caused art to flourish, he was also caught between the conflicts in political power, the Roman Papacy and the Medici family’s whims. He apprenticed and learned the art of fresco for one year at the studio of Domenico Ghirlandaio and then went to study at the Medici’s sculpture school. Soon after he got invited to the house of Lorenzo de’ Medici, the Magnificent and had the chance to talk with some younger members of the powerful family, including Pope Leo X and Pope Clement VII. He also met many important people that visited the Medicis. Michelangelo was one of the greatest students of human anatomy. He was still studying in the Garden of San Marco when he started studying human anatomy by studying corpses. The Church at that time forbid this act, but he had befriended Niccolò Bichiellini, the prior of the Church of Santo Spirito. As payment for his permission, Michelangelo created a wooden crucifix for him which showed the details of the face of Christ. However, his health was drastically affected by his frequent contact with the dead bodies that he had to stop his anatomical study sporadically. At age 16, he had already developed his personal style and had created two relief sculptures, the Madonna of the Stairs and the Battle of the Centaurs. On his first Roman sojourn he was able to study classic statues from the newly excavated ruins. In 1496, he sculpted his first large scale work and one of the few pagan works he did. The more than life size statue of Bacchus was hailed as a rival to ancient statuary. It was the highest mark of admiration in Rome during the Renaissance. He was 21 at the time. After finishing Bacchus in 1498, he started working on the marble Pietà, one of his famous sculptures, which is still located at the Saint Peter’s Basilica. When it was finished in 1500, Michelangelo was barely 25 years old. He depicted Mary as a youthful person, holding the lifeless body of Christ in her lap as she sat majestically, her face expressing resignation rather than extreme grief. It was also the only work of Michelangelo that bore his signature, which he did in a fit of anger, after hearing someone remarked that it was created by Christoforo Solari. His signature, which read, “Michel Angelus Bonarotus Florent Facibat” which translates to Michelangelo Buonarroti, Florentine, made this, was chiselled on the sash across Mary’s chest. Giorgio Vasari commented that it was the work of a true master, a work of art so beautiful, intricate and very detailed that it was impossible to surpass its brilliance. Separately there are so many beautiful features in the sculpture, including its draperies, the detailing of the muscles and joints, and the fine tracery of the veins that seemed impossible to carve from something as hard as marble. Upon his return to Florence, he was commissioned by the Wool Guild to create the statue of David, intended to be used an ornamentation for the Cathedral. This work exemplified the highest point of Michelangelo’s style at the time. 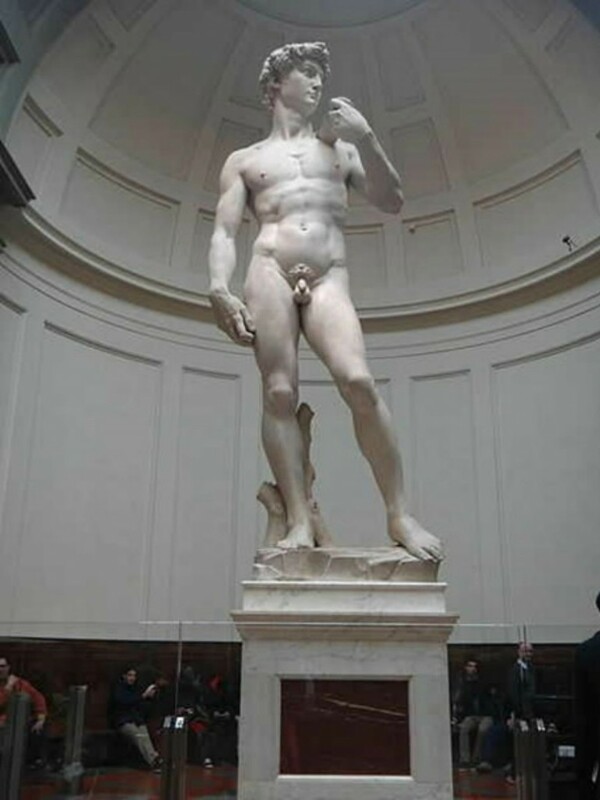 He sculpted the gigantic David, which stands at 14.24 feet from 1501 to 1504. David became the symbol of heroic courage for Florence. The master depicted David as a young, athletic man who was ready to fight. The worried look on his face showed tension. He insisted on it being placed in front of Palazzo Vecchio instead of in the Cathedral. Narrow streets were widened and archways were destroyed just so the colossal statue could be moved to its final destination. It took five days and 40 men to do that job. Michelangelo, who had already proven his mastery of the art of sculpting, showed that he was also an accomplished painter. He was recalled to Rome in 1508 by Julius II and commissioned to paint the ceiling of the Sistine Chapel with the 12 Apostles. But the master artist was able to persuade the Pope to his way of thinking and his ideas for the ceiling. After four years, Michelangelo had completed more than 300 figures. In all there were more than 400 life-sized figures that he painted for this masterpiece. When it was unveiled in 1511, although still partially done, its magnificence had a strong impact on the artists at that time, and even influenced Raphael to change his style due to it.